The structure of Deodorization Pipe. 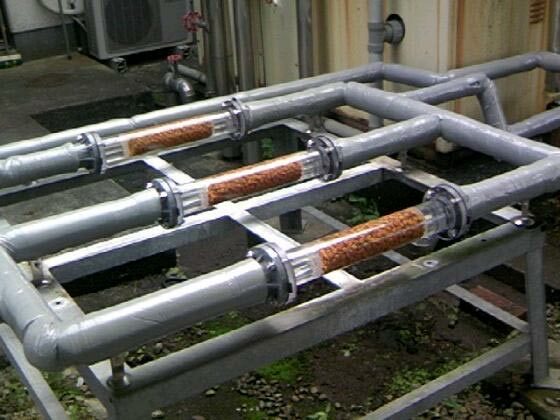 The transparent reinforced plastic pipes are filled with ceramic tips combined with oxidized metals (metals-oxide). How the Deodorization Pipe works. The energy of sunlight especially ultraviolet rays produces electrons after reacting with ceramic tips. Supplied water through Deodorization Pipe is converted to the function water from the normal water. How normal water is converted into function water. After producing electrons, the ceramic tips replenish electrons through the resolution of water molecules. The production of hydrogen occurs in the processed water. the normal bacterial flora in pigs' bowel. Thus it functions as deterrent to odor causing bacterials. As a result, odors from pig manure are reduced tremendously. The effects of on pigs as their drinking water. 1. Decrease of odors of pig manure. 2. Decrease of volume of pig manure. 3. Decrease of odors of septic tanks. How to install Deodorization Pipe. Only one Deodorization Pipe is required per 1,000 pigs. If in the case the water supply is not sterilized, the Deodorization Pipe may get covered with algae (water bloom). Therefore, a normal water sterilization system is required in order to maintain the normal function of Deodorization Pipe. Actual decreasing figures of odor substances and Odor index under experimental usage of Deodorization Pipe. The below inspection results were achieved by using during pre-installation and post installation of Deodorization Pipe. The result analysis shows that odor substances decreased by 90% from 1,300 to 130 in 3 months after the e installation of Deodorization Pipe in a pig farm. It also shows that the odor index was decreased from 31 to 21. This means that a tremendously strong odor changed to a relatively mild odor. According to the Japanese Ministry of Environment, the odor substance (odorant) index of 1,300 means that 1,300 times of odor-free air is required until a participant in the experiment can no longer recognize the odor. The decrease of odorant index figure from 1,300 to 130 means that the odorant was decreased by 1,170 times when diluted with odor-free air.